The purpose of this FOA is to invite applications that address the unmet need to detect cognitive impairment, including dementia, in large and diverse populations seen in primary care across the United States, including in health disparities populations, when a patient, relative, or care provider indicates concern. 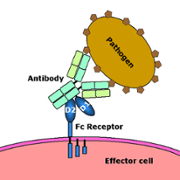 The purpose of this FOA is to encourage applications for translational and clinical research as well as clinical trials that will advance our knowledge about the underlying mechanisms of drug action, response, and safety in children at various developmental stages, and in women during pregnancy and lactation. Join PCORI and the National Kidney Foundation for an hour-long interactive Facebook Live event. Bring your questions about how research can help those impacted by chronic kidney disease and how PCORI's work can make a difference. Hosted by the Emory Physician Assistant program Class of 2018 at Lullwater Park Preserve to raise funds for the medically underserved. Marjorie L. McCullough, ScD, RD, Strategic Director, American Cancer Society, will present a seminar sponsored by the Emory Center for Clinical and Molecular Nutrition, HERCULES, and the graduate program in Nutrition and Health Sciences 4:00 p.m. in the Emory School of Medicine, room 170A. PCORnet is a large, highly representative national network of networks. It collects data that are routinely gathered in a variety of healthcare settings, including hospitals, doctors' offices, and community clinics. Learn the basics about PCORnet and how to get involved in a Patient-Powered Research Network or Clinical Data Research Network. 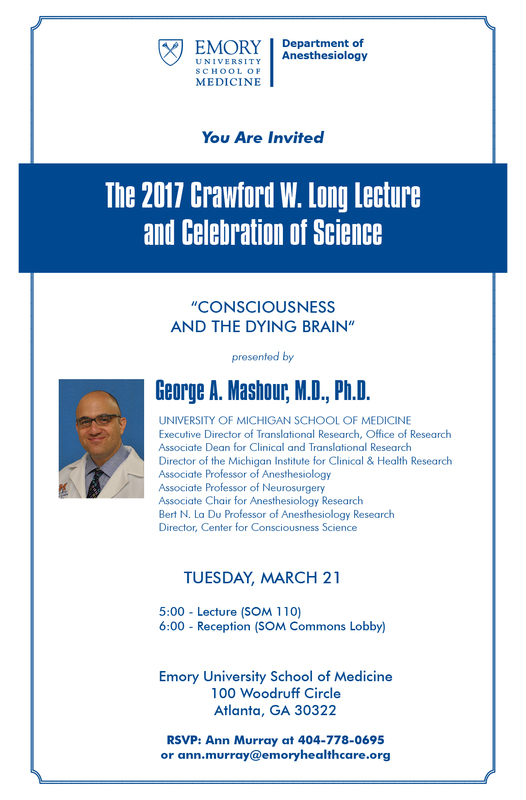 The Crawford W. Long Lecture and Celebration of Science presents George Mashour MD, PhD, University of Michigan School of Medicine at 5:00 p.m. in Emory School of Medicine 110. Presented by Kelly M. Jolley, Esq., Jolley Law Group, LLC at noon. Come learn about using different clinical datasets in your research. Included in the discussion will be Children's Clinical Data Warehouse, Hadoop, and Medicaid data at Georgia Tech. Presented by Machelle Pardue, PhD, Georgia Tech-Emory University BME at 11:00 a.m. in Georgia Tech's Engineered Biosystems Building (EBB), Room 1005. J&J Innovation, MassDevice, and GCMI discuss the state of Southeastern medtech innovation. An open dialogue focused on where we are as a medical device community is necessary for growth. It is crucial to recognize pain points, celebrate wins, and identify new opportunities on a regular basis to foster growth in the Southeast medtech ecosystem. Presented by ACTSI investigator and scholar Colleen Kelley, MD, MPH, at noon. This session will highlight the vital role of working through conflict and how it affects individual and organizational productivity. This event is open to both faculty and PhD students in STEM. The goal is to start conversations around managing and resolving conflict from PhD student and faculty perspectives. You must attend both session. Facilitated by Michael Sacks, PhD, vice provost, University Strategies, Office of the Provost and associate professor, Emory Goizueta Business School at 2:00 p.m. This year's event Striving to Empower Each Partner (STEEP) is a critical way for REM to bring partners together from across Georgia to discuss current and future research in regenerative medicine. The seminar will address the specific needs of mid-career faculty from a culturally responsive approach while offering skill building and strategies for pursuing career advancement in academic medicine. The seminar will be delivered through a blended learning model, including virtual learning sessions, a 2.5-day in-person meeting, and post-seminar activities. A newly published article in Annals of Family Medicine provides an outline of how to engage patients, caregivers, and other stakeholders as partners in planning, conducting, and disseminating research. The hope is that the rubric will help shift the research paradigm from one in which patients are passive subjects to one in which researchers collaborate with patients and other stakeholders to better reflect the values, preferences, and outcomes that matter to the patient community.